Any move is stressful, but a permanent relocation is an incredibly difficult experience that can produce a great deal of anxiety, whether it is because of a new job or any other reason. When preparing for the move, it’s important to pack all the necessities, but at times, it’s impossible to bring all one’s belongings with you in a single bag. When moving to your new home, in addition to moving your items into storage, there’s the matter of packing luggage. It’s important to pack luggage with all of the necessities for at least a few weeks in your new location, as some items may come at a later date of your move. Deciding which items you are going to move, put clothing and soft items such as towels and bedding into a suitcase or duffle bags. Items like towels, linens, and shoes that you do not wear often like sneakers. It’s advisable to ship books and other heavy items. Only bring the book you want to read during your travels and either donate the rest or arrange to be delivered with the rest of your items. Keep clothing you need to get to quickly in the suitcases, it will be easy to spot and remember when the movers unload the moving truck into your new home. There are items that individuals should only bring one of when they are packing, such as bulky coats, sweaters and sweatshirts, particularly if moving to a location with warm weather. These items take up a lot of space and can be shipped or purchased after your move. Doesn’t matter if it is a long distance move or a local move, you’ll be able to quickly get to your suitcase, while those moving boxes with the outfits you were planning to wear for work might take days to find. With careful planning and efficient packing, it’s possible to make the transition go more smoothly, ensuring that you have all the essentials you need to settle in and you can relax in your new home. Deciding what to pack, even on short vacations can be a challenge for many people, so imagine the difficulty if we’re talking about a permanent move. You’re not just deciding what’s necessary to take with for a weekend or even a few weeks, instead you have to decide what you’re going to need on a long-term basis. When packing for your move, careful planning and consideration is required. Apart from NYC moving tips – tips for moving abroad, Dumbo Moving + Storage can offer the following tips for preparing to pack your luggage for your move. The first step is to pack your first batch of luggage in the same way that you would pack for a long vacation. Have a few changes of clothes, shoes, and any essential items, such as toiletries, medications, and that you are taking all the right documents and paperwork with you when moving, which you’ll need when you arrive at your destination. Some people choose to pack travel-sized items that lasts them through the first few days after their arrival. Larger items can be purchased later, so people can save valuable space by excluding them from your luggage. It’s advisable to make a definitive moving list prior to packing. If you are in charge of packing for the entire family, you must remember to include everyone’s items on the list as well. The first batch of items in their luggage should only be items that are needed right away. Be prepared and check the weather at the new location for each day for a few weeks, so that you have a good idea of the climate and fluctuations in the weather that can occur at your new place. For anyone in the midst of a move, it’s important to consider the items that you must bring and also items you shouldn’t bring. The hardest part is determining what you can actually live without, at least for a while. People sometimes feel compelled to take their favorite toiletries and household items from home, such as shampoo, toilet paper, towels and toothpaste, but these items can be left behind, as they can be easily purchased at your new location. You can bring a few necessities in your luggage, enough to last you up to a few days, but brining more of the same item is not only a waste of space, but can cause problems, especially if you are travelling to your new home by air, as it should be easy moving through airports and comply to airline bag sizes and weight limits, as well as passing airport security. Remember, whatever you left behind, can likely be purchased in your new location and if not, you can always order special items online, which can easily be delivered once you get there. People who travel a lot already have some suitcases and other bits of luggage, and if you are permanently moving it is important to have high-quality, durable luggage that will not break or rip easily. You might be in a situation and find yourself living out of a suitcase during the transition, until all your possessions get delivered by the moving company. 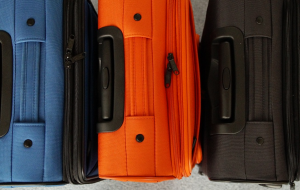 If you don’t already have a luggage set of your own, purchasing a brand new luggage set with accompanying carry-on bags as needed is the best route for a permanent move, since this allows you to have matching bags that are easily identified during traveling. On the other hand you’ll always have a set which you can use on your next vacation or you can always try to sell it online if you think it will be taking up room at your new home. Moving to a new location permanently is a difficult process, but it can also be an exciting time. While it is impossible to fit your life into a few pieces of luggage, with careful planning and decision-making, it is possible to include all of the necessary items you need for a start at your new home. How to pack for a trip?